Many factors can diminish the beauty of your new vehicle including moisture, high humidity, road salt and pollutants. As your vehicle ages, proper maintenance becomes even more important. Sure Auto & Glass / Rust Check® Centre in Hamilton will help protect your investment. For about the cost of 4 oil changes, you can protect the structural integrity of your vehicle with the effective Rust Check® system. Watch this video to see the process in action. Even though manufacturers now use corrosion-resistant innovations like galvanizing, high tech plastics and specialized coatings, these measures are not nearly enough. During automotive production, vehicles undergo thousands of spot welds and a multitude of bends and folds. These processes damage the pre-coated metal and give the corrosion process a head start. On top of the obvious cosmetic concerns, corrosion will weaken your vehicle’s structural integrity and cause problems with your steering and suspension components. Why Should You Choose Rust Check®? Corrosive contaminants are devastating to a vehicle over time as they seep into inner panel seams and destroy your vehicle’s metal. Corrosion impacts more than appearance as it also attacks the joints and welds that hold your vehicle together. What was once a beautiful new car will become a hazardous eyesore if not properly protected. Sure Auto & Glass / Rust Check® Centre will provide the protection you need. 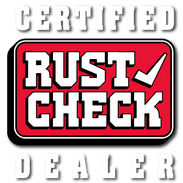 The Rust Check® system gets into the seams and crevices where salt and moisture commonly settle and drives them off and away from your vehicle’s metal surfaces. Other rustproofing methods using tars and waxes are not effective as they are too thick to access the areas where corrosion begins. Some sealants may actually do more damage than good as they trap in moisture, thus accelerating the corrosion process. Please speak with a member of Sure Auto & Glass / Rust Check® Centre or simply stop by our shop to learn more. You can also find more information on the Rust Check website.